A spacious 17th medieval house, with original terracotta tiles, provencal ceilings and inset oak cupboards throughout, and a large roof terrace( with a summer kitchen) for meals and sun bathing! On the first floor is the drawing room which is large with a high ceiling, and has the dining table. The family kitchen is fully equipped( oven, fridge, hob, dishwasher ) , . Thick walls ensure that the house is cool in the summer, and the central heating is quick and efficient in the winter. There are two bedrooms on the second floor, one of which has two beds that can be pushed together, and one double (160cm bed ) . The double room has its own basin, and the two rooms share a bathroom, and loo. On the floor above is a small twin room , a shower room and a separate loo. The central staircase is original, and fairly steep !The terrace leads off this top floor. Very much a family home, with the owners coming often with children aged from 23 to 7! Saignon is beautiful and unspoilt,perched up in the hills, and children can play around the fountain on the square in front of the house, and explore the village with its 12th century church, washing fountains, and narrow winding streets. Approx. 1- 2 hours' drive to Marseille (with its creeks and beaches). the Camargue(Arles), Aix en Provence, and Avignon. The other Luberon hilltop villages(Gordes, Lacoste, Menerbes, Bonnieux, Goult ) are 20 min’s away, and Apt, a bustling market town is 5 min’s away with a fabulous large and clean swimming pool with a children's pool too. This location and house are perfect for getting away from it all... Basics can be found in the village,( the boulangerie is next door !, with bread , pastries and basic breakfast stuff ! ), the village is fascinating to walk round with endless nooks and crannies, and a fantastic ‘rock’ which you can climb up to survey the entire valley. The house itself feels very warm and loved, with furniture collected over the years by the owners who spend as much time as possible here, including in winter with the cold, sunny weather of Provence. For those who wish to be on the move, there are a thousand different things to visit and do locally, you can find an outdoors market almost everyday of the week...and for those who want water, the pool in Apt is huge and clean, with two smaller children and toddlers' pools and a protected picnic area, and is fairly empty in our experience in the mornings, even during holiday times. We tend to go there in the morning, with a basic picnic, have lunch under the trees and then head home when it is too hot ! The winters are gorgeous, the sun often shines ! and moving around is much easier..there are many things to visit: towns like Marseille, Avignon, Saint Remy, Aix en Provence.... and days out like the Chateau La Coste,a beautiful winery and Sculpture Park near Aix en Provence. The markets are much more comfy for mooching around in the winter...! and we enjoy cosy dinners in little restaurants in the local villages.. The owner is an interior designer, living between France and England, three children between 27 and 12 who have spent all their childhood/ holidays in the region. There is a parking spot outside the house for unloading , but all cars are encouraged to park behind the church ( 200 meters) to keep the village square car free. Help yourself to anything in the cupboards ! 3 floors with the original, fairly steep staircase, without a handrail . The house has a large, comfortable roof terrace with table, chairs and a parasol, and an efficient summer kitchen. Partly shaded, this is the prefect place to spend summer days. As the owners stay in the house regularly, it is well equipped for family life, and everything is at the disposal of the guests. The house is just set back from the village square, with the boulangerie next door, and the village shop a few doors down with basic supplies. There are two good restaurants in the village, one of which also serves as a bar in the summer, and has a large pretty terrace on the village square., and there is mobile phone access and Wifi in most of the house and on the terrace. The apartment and the village are so cool- a truely authentic Provence experience! Elizabeth was an exceptional hostess, so knowledgeable and helpful in planning our vacation! Wonderful stay in Saignon. Thanks Elizabeth! Lovely old, characterful house in centre of village. 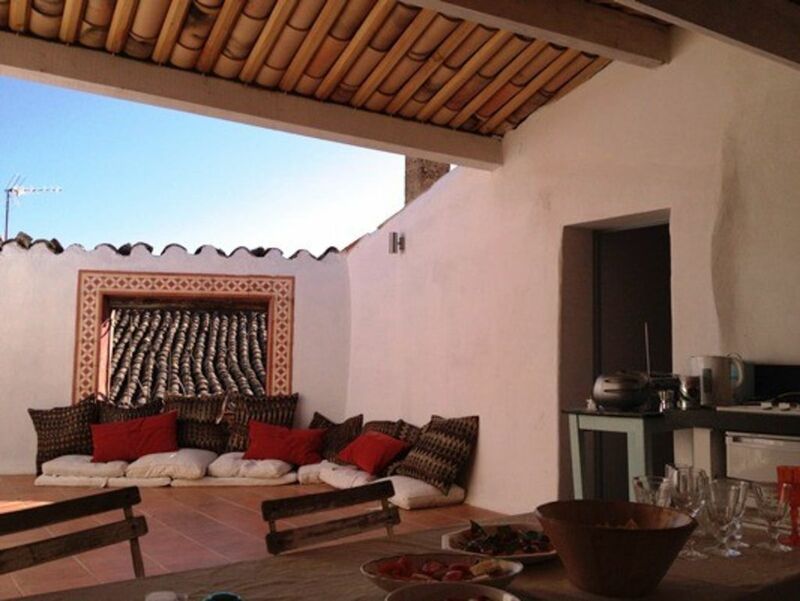 But also very practical - 2 bathrooms, a great second kitchen on the roof terrace. We were only there for a few days for a wedding but the house would be very comfortable for a much longer stay. Elizabeth was extremely helpful and accommodating and allowed us some flexibility in arrival and leaving times. We had a fantastic time and would love to return. The house was utterly beautiful, even better than the photos. My husband and our two daughters felt like we were staying at a friend's home, so comfortable and the furniture and decor are fabulous, we would love to return. Elizabeth the owner was really helpful. The village of Saignon is stunning and a great place to explore the surrounding area's. We had such a lovely time here. It feels like a home rather than a soulless rental property. We really enjoyed cooking & eating on the roof terrace. The village also has a lot of character, is beautiful & less touristy than some of the other villages in the region. Whilst small it has a few good restaurants including the fantastic Le Petit Cave. We enjoyed a lovely week in this gorgeous old house in the centre of the village. The house is full of character and charm. We spent most of our time using the summer kitchen, enjoying meals on the roof terrace and didn't even use the dishwasher! The village is peaceful and there are superb views from Le Rocher! The boulangerie is just next door, ideal and we also had a couple of lovely meals at the restaurant Balthazar on the next corner. Provence is my favourite place! This was the third time I stayed in this lovely house: I fell in love with it and the village of Saignon several years ago, because it still feels and looks like an authentic French Provence village, not a luxury touristic estate. The good surprise this year was the new top floor terrace, second kitchen and extra bedroom & very modern second bathroom at the top of the house, which means in summer you breakfast on the terrace looking out over the roman-tiled roofs of the entire village. This is in addition to: a downstairs hallway & utility room, a kitchen and large drawing room , all on the first floor; then a master bedroom and a large guest bedroom plus a bathroom and a small sewing room. The house wa stone-built to last centuries ago, so even at midday in August, the rooms inside are cool and restful. The décor is shabby elegant in the way decorators strive for; but here it is authentic. There's a combination of old family furniture, comfortable sofas you sink in, antique tiled floors, garden chairs in the kitchen, books that have been read and re-read in the bookcases; but good firm beds. It's got oodles of charm and enough modern conveniences to spend a great summer en famille. You need a car because the local buses are slow and come every hour or so only; the one going from Apt (the market town a couple of miles down the hill from Saignon), all the way to the TGV station at Avignon takes nearly two hours. The area is stunningly beautiful; you can walk across picture-book lavender fields; visit the region's chateaux and monasteries; attend the Avignon theatre festival in season (summer) as well as many summer classical music festivals; there's a municipal swimming pool for your teenagers at Apt. Further out is Aix en Provence with the greatest French opera festival in summer. Avignon had monuments and museums from the time it was the Pope's residence; it also has goos restaurants; and of course the entire countryside was where Cézanne, Picasso, Renoir, and many more painted. Saignon is a beautiful, unspoilt mediaeval hilltop village perched above Apt, a bustling market town. Accessible both from Marseille and Nimes airports, and Avignon Eurostar train station, it is one hour inland from the coast. The village is tiny and has gorgeous views over the hills of the Luberon and the adjoining valley, areas renowned for their beauty, protected by the Luberon's status as a National Park. Many historic places to visit all round the area, and breathtaking walks...and a fabulous public pool in Apt, with a huge clean pool for adults and two smaller children and toddlers pool. The weekend rate is £500 (or a minimum of 4 nights) , plus £70 cleaning fee ..A security deposit will be asked for, in case of breakages. . £70 cleaning fee applicable. Christmas/ New Year, and Easter rates to be discussed with the owner.